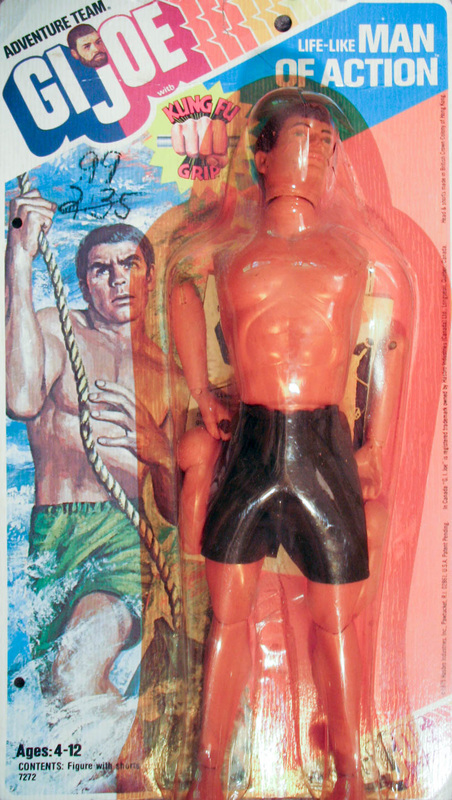 The 1976 Life-Like Man of Action was released in two carded versions, a basic (7272) with just the figure and shorts and the complete version (7284) with shorts, green fatigues, boots and a black hunting rifle with rubber strap. The Man of Action comes with brown flocked hair, no beard, and blue eyes. The basic carded version is seen immediately below. There is also a rare variation of this figure with classic GI Joe hard hands, molded in the same material as the MOA's body. If you can share an image of this figure, please contact me! Below, the complete carded version with fatigues, boots and rifle.